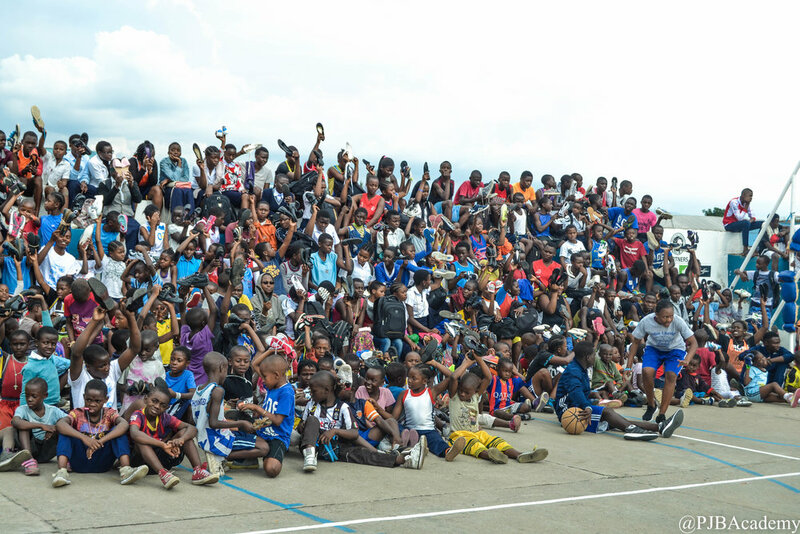 We are constantly looking for ways to increase the promotion of basketball within Goma and the DRC. In our work with physically handicapped players, we already have a wheelchair basketball team, but in August we reached out to a new community, the deaf and the mute. Since August we have been training a team of deaf and mute players in basketball skills. 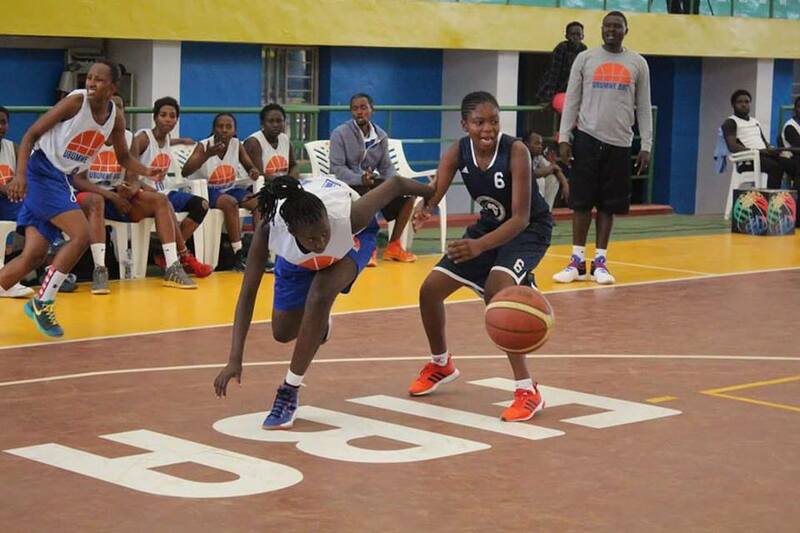 The idea for the team came from a 16 year old PJB Elite Girls player named Amina Naseremba. Amina is fluent in sign languages and was excited to begin a program with this new community of youth. All of the players for the team come from a local school for the deaf called EFATA. Coach Amina, even though she is hearing and speaking enabled, has also attended EFATA for the past 4 years. Amina comments on her new program, "(Coaching basketball to deaf-mute players) is not easy because it is a very aggressive sport. Coaches must be attentive and sign clearly or else there can be a lot of disputes." So far the program has gone well. There have been some obstacles in communication and integration while starting the program, but we at PJB are confident that we can fully incorporate the deaf-mute team into the family. This will also allow for a better understanding and camaraderie amongst our players and all communities of Goma. The PJB Life-Skills program began this month. The first division players, encadreurs, and coaches participate in the program once a week. The first round of the life-skills course is focused on developing a general knowledge of the key themes of the curriculum: personal development, communication, collaboration, professional development, and problem solving and critical thinking. At the end of the 12 lessons, PJB will evaluate the first course and plan to expand the course to other categories and teams. The units covered so far in October are: the importance of personal values, writing SMART goals, and personal health. 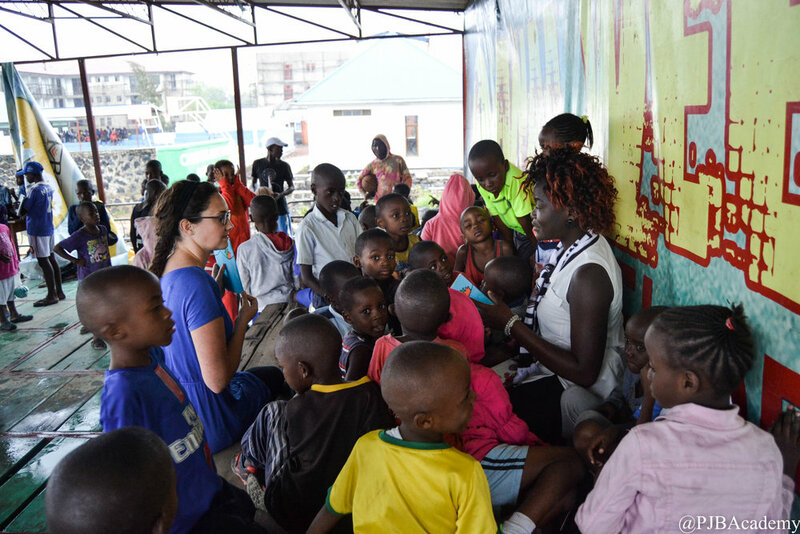 PJB began collaborating with the Maison des Jeunes library this month to host story-time for the Baby Basket team directly after their Wednesday practice. Reading aloud promotes familiarity with books, inspires curiosity, and cultivates a love of learning early in childhood. The stories will also reinforce the teaching of PJB values - discipline, team spirit, hard work, and respect. As posted earlier this month, we were extremely happy to receive our first shipment from our new partners at Sal's Shoes. 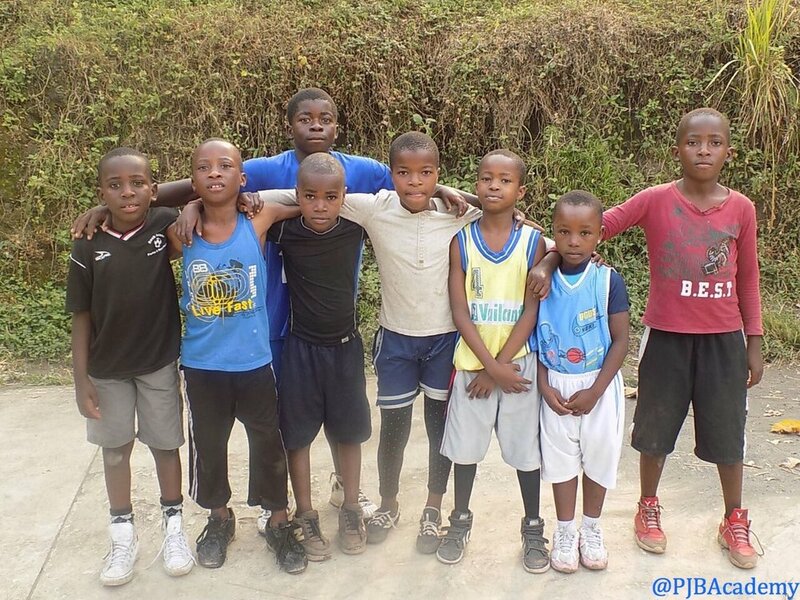 Thanks to a joint effort, along with Falcon Coffees, we were able to provide school shoes, toys, jerseys, and basketball shoes to members of PJB and our partners. We want to again thank both Sal's Shoes and Falcon Coffee for their generosity. It is an exciting time for PJB as we received our first shipment from a new partner, Sal's Shoes. 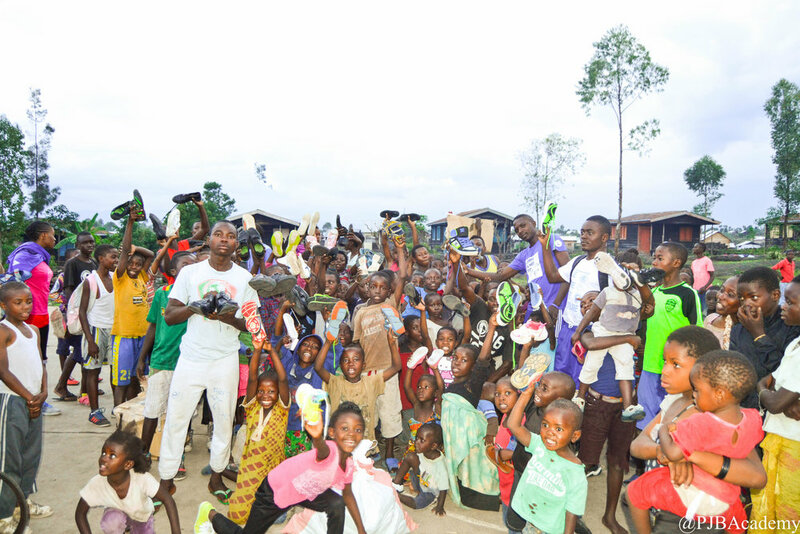 We were able to award school shoes to our hard working and disciplined youth players, as well as some new tennis shoes for training to our Baby Basket teams. Across the three main courts of PJB, we held celebrations this past week (October 3-7) to recognize each deserving player. September 21 is the International Day of Peace. With celebrations worldwide, PJB and 385 of our members held a celebration of peace at our main court in Maison Des Jeunes. The celebration included a march along with our partners from the Jane Goodall Institute, games, speeches, making peace doves, and planting a Peace Pole. 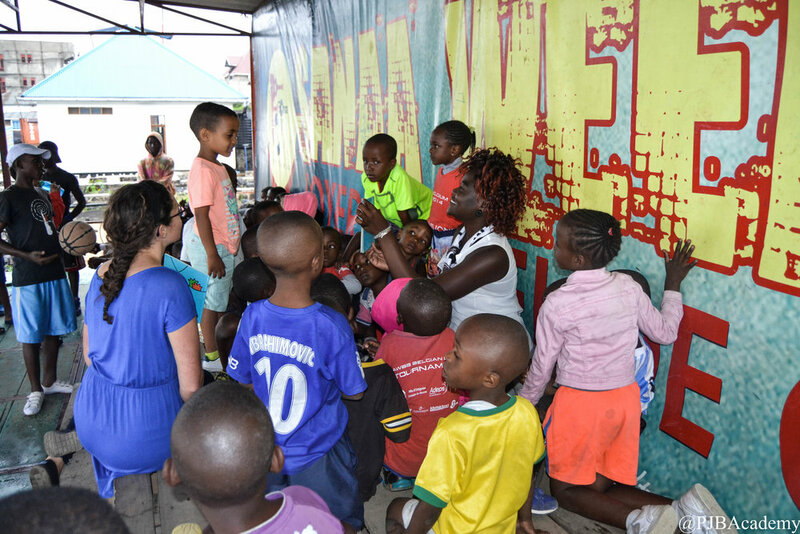 Through education and basketball we promote peace and development within the community and country on a daily basis. Today was our day to celebrate our successes and reflect on challenges in ensuring peace within our community, country, and world. Please enjoy the video of our Peace Day event! Photo of Patrick Mwamba with his trophy as the best shooter in the tournament. On August 2nd, the U18 men's national team returned to Goma after finishing in 6th place at the FIBA U18 African Championships in Kigali, Rwanda. Assistant Coach Kipere Mulolwa and the rest of the team were warmly welcomed home by the community with great pride and admiration. PJB player Patrick Mwamba also brought home some hardware with the Top Shooter Award for the tournament. 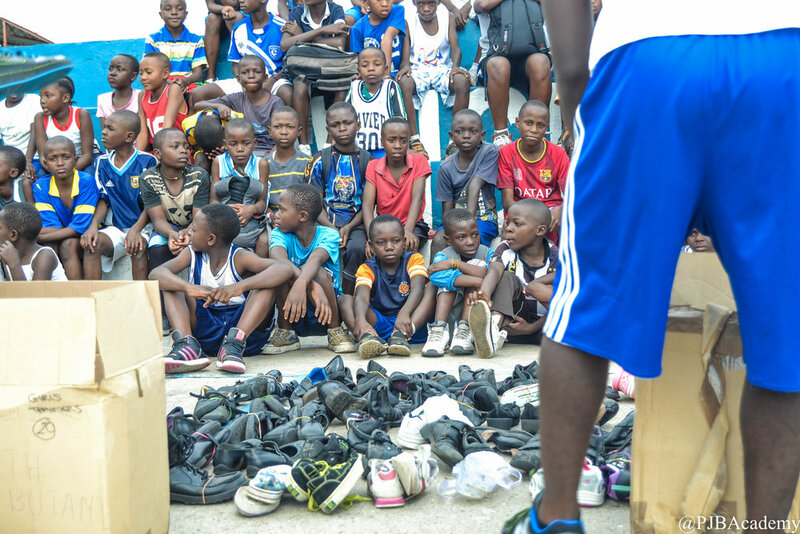 The North Kivu provincial tournament was held in Goma this year at the newly refurbished cercle sportif. (Click Here for footage from the inauguration of the new court) All four PJB teams who compete in the 1st division qualified for these provincial finals. Both the Elite mens and women's teams qualified as the top seed in the tournament, and the Leopard women's and mens qualified as the second and third seeds respectively. The PJB Elite women's team was crowned champion for the fourth year in a row beating the Leopard women's team in the finals. This tournament has been dominated by the play of the PJB women for the past couple years, and we plan to continue our dominance. This year was the fourth consecutive year to have a PJB representative in the men's provincial finals. The two-time champion PJB Elite lost in the semi-finals to the PJB Leopard team and finished third. For the final, PJB Leopards squared off against Goma Bulls in a best of three series. Unfortunately Goma Bulls prevailed with strong rebounding and dominance inside to win the series, 2-1. Trophies for the Junior and Youth teams who finished first in their tournaments. 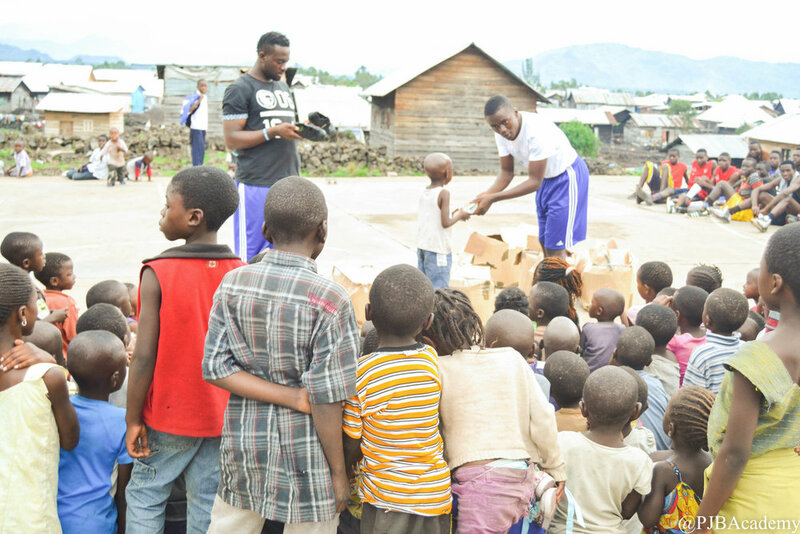 Also this month, a new basketball organization in Goma, Jeune Voluntaire, held a tournament of their own. The tournament had three divisions: youth, junior and senior teams. PJB participated in the youth and junior tournaments, winning both. For the junior division the PJB Twiga team came home with the trophy, and in the youth division a select group of top youth players outlasted the select youth of Bukavu GoYouth (South Kivu, DRC) to win the championship. 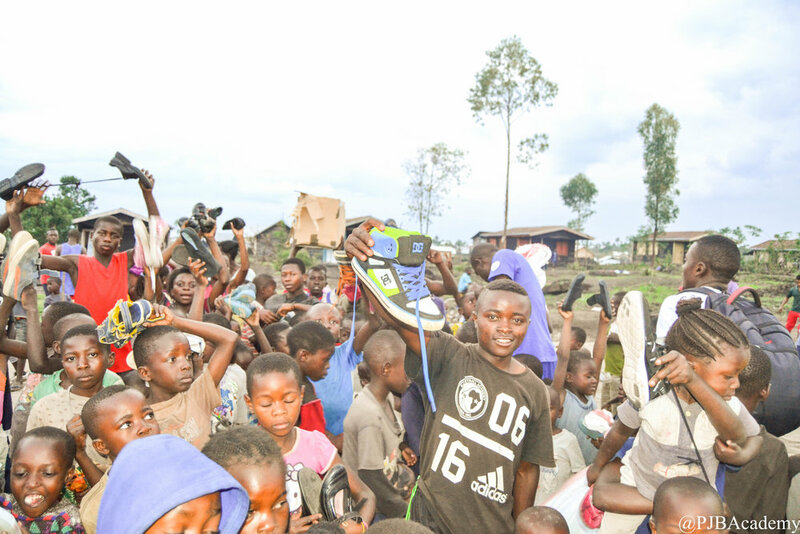 Ezeckiel- We left from Goma for Bukavu on Wednesday August 24, 2016 and arrived in Bukavu at 2:30pm. We were a team of four coaches going to give a camp to Bold Academy. We gave camps across three categories: Youth, Debutant (beginners), and elite. Coach Sensel coached the youth camps, coach Denny coached the debutant camps, and I, Ezeckiel, was the coach for the elite camps. For me it was a pleasure to work with the Bold Teams and train the coaches there for 2 days. We taught the coaches how to teach the fundamentals of basketball and how to plan their practices. They asked us for a lot of advice for their program like how to develop discipline within their players. We also worked together to think of ways that Bold and PJB can better collaborate. Denny- For me this was a great experience to share my knowledge (In coaching) outside of my province with another family (Bold) and to adapt totally to the new environment. Along with Bold Academy we shared and adapted all of the exercises we could give. We gave training to the coaches for one hour and worked with players and coaches on the court for two hours. This continued over two days. I think that Bold Academy benefitted a lot from the coaching training that we gave them. English classes began in the month of August for the Elite and Leopard teams at PJB. Every Monday, Wednesday, Friday, and Saturday classes are offered for PJB players. These classes are taught by Emily Barry (Education Coordinator) and Matthew Kearney (Senior Coach) who are recent hires from the USA. These classes are the beginning of the English program at PJB, and hope to expand classes across all categories of players. This month PJB lost one of its biggest fans. Papa Kasuku passed away on Wednesday August 17, 2016. Known by all as a positive force in the development of North Kivu, we look up to Papa Kasuku as an example for all members of PJB. We strive to continue his vision of a peaceful and prosperous region. You will never be forgotten. PJB Elite Boys team before their first match. 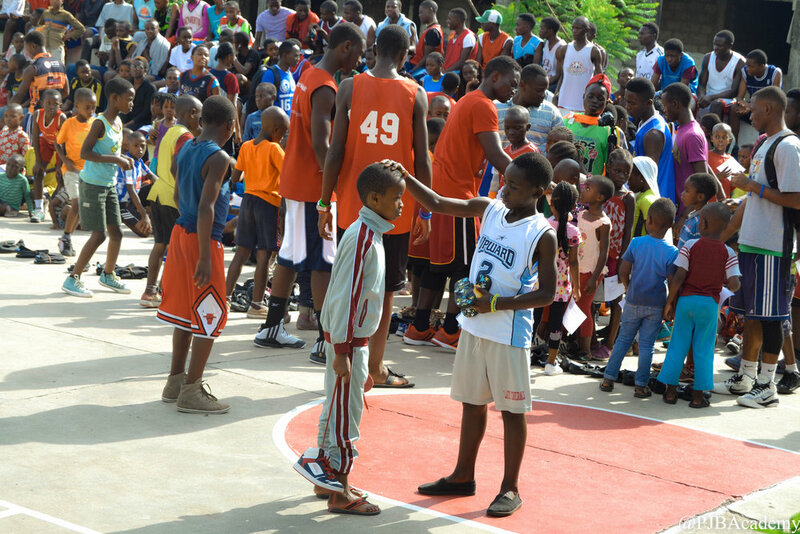 Every year an international basketball tournament is held in Kigali, Rwanda in remembrance of the Genocide of 1994. This tournament is called the Gisembe Tournament and is held at Amahoro Stadium in Kigali. This year both our boys and girls Elite teams were invited to the tournament. This was the third year participating in the tournament for the PJB Elite boys, and the fourth year for the PJB Elite girls. Every year this tournament is a great opportunity for our players to gain international experience, and play against some of the top competition in the east/central Africa region. Our girls Elite team finished in third place despite playing without four key players (Davina Kabantu, Amanda Kabantu, Deborah Moto, and Christelle Lubango) who all had to miss the tournament to sit their second round of national school exams. 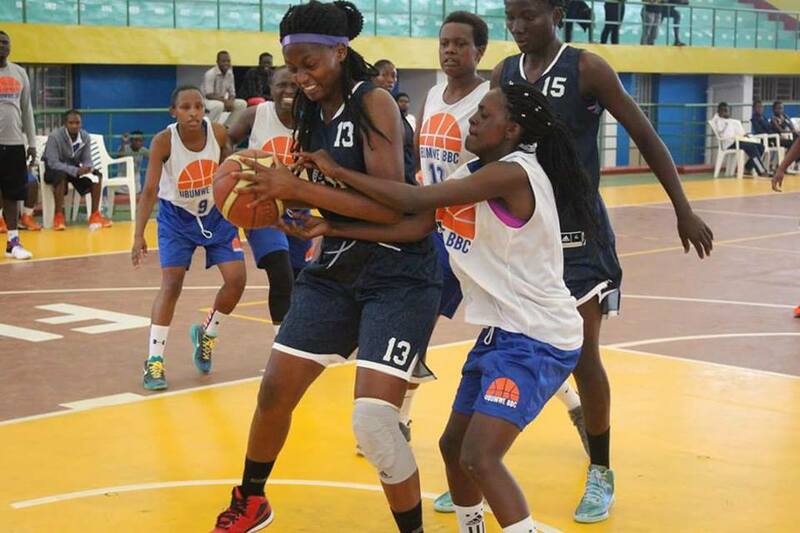 The girls team was led by the strong play of guard Gemima Motema and forward Grace Irebu. The boys unfortunately didn’t place this year after finishing second in last year’s tournament. The boys were dominated on the glass throughout the tournament without the presence of starting forward Michee and reserve center Bretener Mutombo and David Kalala, who were sitting the state exams. Also missing from the tournament for the boys was Jerry Kabantu, who was missed both defensively and offensively at the starting point guard position. The boys played hard in their normal fashion, but showed their youth and lack of size in their losses. A high point in the tournament for the boys was when guard Patrick Mwamba won The Top Shooter award in the tournament for the second year in a row. Patrick is a young player with great promise. Though PJB was hoping for more success at the tournament, a lot was learned. Head Coach Kipere Mulolwa was disappointed in the results, but praised the fact that, “Both PJB teams were praised for their discipline shown and great sportsmanship.” Now that this great tournament is over, both the boys and girls teams turn their eyes to the future; Winning the provincial cup and returning to the Cup Du Congo. Every year PJB sets goals to further increase the reach and effectiveness of it's programming. Throughout the year our staff monitors and evaluates our progress towards these goals. At the end of each year we publish a report with our findings. Please view our 2015 annual report to understand better the impacts and programs provided by PJB. We also take great pride in our program prospectus at the end of the report to see the growth we hope to achieve during 2016.